“Muncie is the community where my ties of wonderful friendships and relationships are. The community as a whole has treated us and our business very well, and now is our time to return the favor,” says Kent Shuff, Muncie business owner and Community Foundation donor. Kent, originally from Huntington, came to Muncie in 1978 to attend Ball State University. He has stayed in the city ever since. Growing up, he worked in his grandmother’s restaurant and has been in the restaurant business since 1984. In 1999, Kent, along with Steve Fennimore, opened Vera Mae’s Bistro in downtown Muncie. The two have come to call this community home. As they’ve grown with the community, Kent and Steve recognize the importance of giving back to a place that has given so much to their business. Kent serves on the board of the David Owsley Museum of Art at Ball State University. Steve has served on the board of Muncie Downtown Development. Both are active in other community efforts as well. In addition to their service, they note the need to pass the giving baton to the next generation so they, too, can make a positive impact on the community. The couple established the Kent Shuff and Steve Fennimore Fund at The Community Foundation, an unrestricted fund. Their decision to create a fund through The Community Foundation was initiated by community leaders and personal desires to make the broader community a better place. "Muncie is where my ties of wonderful friendships and relationships are." An unrestricted fund through the Foundation allows Kent and Steve’s contributions to make a broad impact on the many causes they care about. Kent specifically appreciates the Foundation’s support for the betterment of the community through art. According to Steve and Kent, making their community smile is important to them. “We chose The Community Foundation to start our fund because they are very well established and provide first-hand information about the projects that have been supported by the fund,” says Steve. 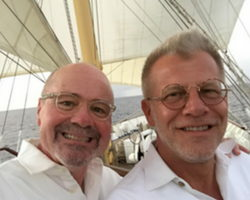 Aside from their fund with The Community Foundation, both Kent and Steve practice philanthropy elsewhere in the community. They host an annual fundraising event. “Dinner on the Deck” supports the YWCA of Muncie. “We donate every single penny raised to YWCA because we have a soft spot for underprivileged women and children. The YWCA provides services to them,” Kent says. Kent and Steve are also involved with ARF, Big Brothers Big Sisters, Cornerstone Center for the Arts, and Muncie Civic Theater. They often donate to arts programs to make up for some of the funding they know is often cut from arts programs in the community.